Five months in: mid-year update! For education professionals, the post-holiday stretch into spring break is full of middle-of-the-year testing, sick kids, and snow days. To some, a snow day might sound like a reprieve. To us, it means that the plan we meticulously put together to meet state testing standards is now out of whack. It means days we were expecting to receive professional development are gone for snow day make-up. It means a restless night worrying about our kids who may not eat if they aren’t at school, or have adequate heat in their homes. We worry about the families of our students who are scrambling to find child care because if they take a day off from work, they’ll lose their jobs. While we may catch a few flakes with our families, those worries weigh on us. Those worries about our kids’ families, and our own frustration at not being able to fully meet their needs (intellectual, emotional, physical) – fuel our desire for change. For the past several years as a union, we have fought against the onslaught of attacks against public education. Between battling budget cuts, staving off attempted deportations of our students and families, and protecting two of our elementary schools against privatization, we’ve spent a lot of time and energy on defense. Our organization’s mission is to defend public schools – but not only that: it’s to “defend and transform.” The Community Schools process is a chance to define our vision and transform our buildings into the schools that kids and families deserve. 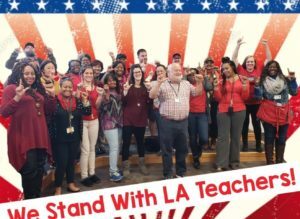 Teachers, counselors, bus drivers, Instructional Assistants, and custodial staff are working with full-time organizers in their buildings to start prioritizing, planning, and eventually lightening the loads that our economic system increasingly lays upon the shoulders of students, families, and staff. These full-time organizers, also called Community School Coordinators, support the process. They will gather the great strengths and resources that already exist in our school communities, pinpoint the values most important to staff and parents, and help us identify the root causes of our challenges. They’ll work with us to figure out how to best use what we have, and recruit what we most need. Southwest is so excited about taking on the Community Schools Model! This enthusiasm shows as teams of staff and parents rally around the process. We have a strong Staff Engagement Team made up of staff in various roles – two grade level Teachers, two Instructional Assistants, the Teaching and Learning Coach, Principal Intern, School Counselor, School Social Worker, School Psychiatrist, and Restorative Practices Coordinator- who created a survey specifically for Southwest to prioritize improvement efforts and envision our ideal school. The survey portion of the listening project launched in December and we have 100% participation! Southwest Parents are equally as enthusiastic. 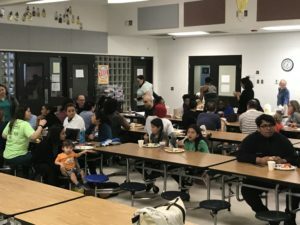 At a November PTA meeting, which had a focus on the Community School Listening Project, turnout was doubled with over 60 parents participating in a Listening Project activity. We had the opportunity to gather feedback from this diverse group of parents about what they love about Southwest, what their ideal school looks like, and what we need to achieve that vision. Over 15 parents and staff have joined the Parent Engagement Team, and are excited to start the process of engaging 75% of our families in the Listening Project. The Latinx subcommittee of the Parent Team is planning a February Latinx family engagement event to gather feedback and strategize building Spanish-speaking parent leadership at the school. Lakewood Elementary has an energetic Parent Engagement Team that is well on its way to reaching a goal of conducting 100 one-on-one “relational interviews” with parents by early February – to build relationships, identify potential parent leaders, and learn what parents feel are Lakewood’s strengths and most urgent needs. Lakewood saw a 400% increase in turnout to PTA meetings, with extra effort from their Community School Coordinator and engaging small group discussions where parents have the opportunity to talk with each other about their vision for the school. Since launching the Parent Listening Project, Lakewood has convened the first P.A.A.C. (Parents of African American Children) meeting, and Latin@ parent leaders are working with the Community School Coordinator to launch a Latin@ subcommittee of the PTA by the end of February. Lakewood screened the movie “Coco” in Spanish (with English subtitles) this fall, and over 130 families attended for a movie night with popcorn, arts and crafts, and hanging out. Lakewood parents, in interviews so far, say they want more opportunities to connect socially with teachers and each other in relaxed, personal way. E.K Powe parents and staff have also had a chance to share what they most love about their school. When asked, many parents and staff said the same thing: “The sense of community.” Walking through the halls of E.K Powe, it is easy to see why; there is a warm and inviting feel that is hard to ignore. That said, Powe has not been successful yet in cultivating the leadership of parents of color, and that has been a core focus for Evelyn Ponce, their Community School Coordinator. 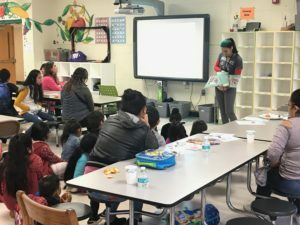 As a result of Ms. Ponce’s persistent behind-the-scenes efforts, an economically-diverse group of 25 parents attended the first Parents of African American Children (P.A.A.C.) meeting in November, which focused on relationship-building and reflection on the Black experience at Powe. Parent discussion was facilitated by 5th grade teacher Nia Imani-Farrar. Powe’s principal said: “She [Ms. Imani] has been looking for a way to lead – and this was her shining moment!” Ms. Ponce and Ms. Rodriguez, an Instructional Assistant, facilitated self-esteem-building, pro-Black activities with students in the child care space. Ms. Ponce also worked with Ms. Rodriguez and the ESL team to hold a Latinx breakfast in November where families came to eat together and learn how they can better support their students at home in reading. Attendance at this Latinx family event increased by 500% from events in past years. Families gave excellent feedback, and another breakfast is planned where families will play vocabulary games together. Having already completed their Assets and Needs Assessment, Club Boulevard is now working to become the school parents, educators, and community partners described when asked to share their vision for the school. 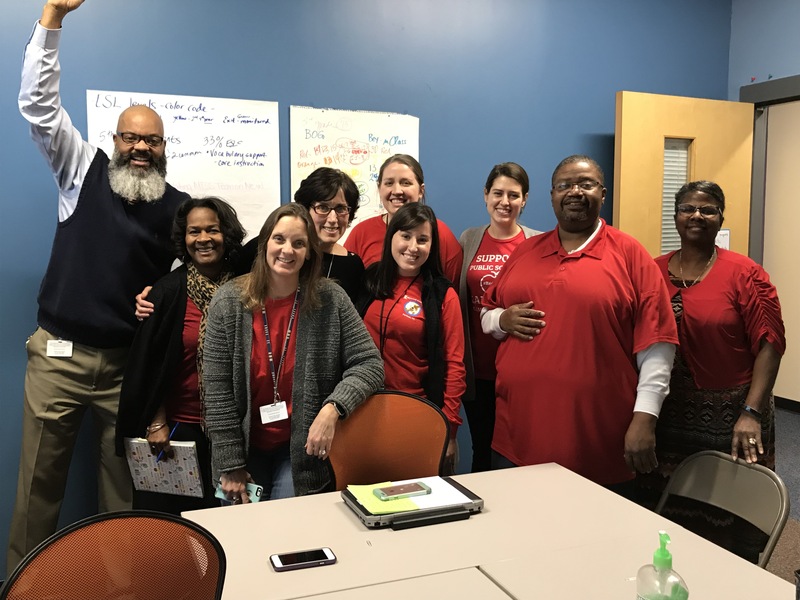 They started off the year by forming a Communication Problem-Solving Team made up of diverse parents and staff, who have met several times a month to strategize improving two-way communication for our diverse student body. Their first task was to survey 95% of families to learn each family’s preferred mode of communication. The survey process itself has also helped the school learn how best to reach all families. This team will present their findings, and a new proposed school communication plan, next month to the Community School Leadership Team. Responding to challenges raised during the listening project, Club’s PTA has been working closely with their Community School Coordinator to put on a series of workshops, lead by Dr Ronda Taylor Bullock of we are: Working to Extend Anti-racist Education, to teach parents and staff about how to use children’s literature to have proactive conversations about race with students. Together they also secured a grant to fund the workshop series, including dinner and childcare, and to allow Hope Valley Elementary to participate as well. Club’s Community School Coordinator is also working to build new partnerships that can help support the academic growth of our students of color. She has developed new partnerships with the HELPS Education Fund at NC State, the Augustine Literacy Project, Duke’s Partners for Success program and NC Central University Service-Learning program to secure trained volunteer tutors to provide additional services in our classrooms. She also recently secured a partnership with PetPalsNC to place a therapy dog at Club to help kids who struggle with anxiety. 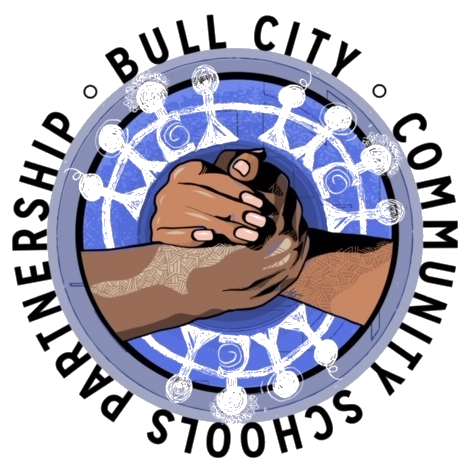 The Bull City Community Schools Partnership has benefited from the immense support of so many individuals and organizations in our community who are eager to lift up the successes of Durham Public Schools, and help staff and families tackle challenges. Thanks to hundreds of generous individual donors, our grassroots fundraising campaign has raised almost $30,000 to support costs associated with the Listening Projects and other programming at the pilot schools. The Partnership also looks forward to sharing tools for staff-led staff engagement and parent organizing with other schools in the district. Let’s work together to empower all staff – classified and certified – and all families – particularly families of color – as agents of school transformation. Previous: Previous post: Welcome to the Community School Coordinators!